At 24 grams of sauce per serving, it can serve up to 125 people! Keeping my Chinese dishes authentic is a challenge because of my staff's varying skill levels. 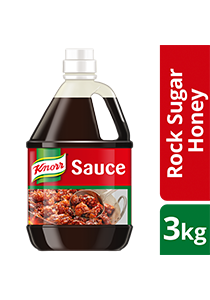 Knorr Rock Sugar Honey Sauce gives you consistently authentic taste because it contains yellow rock sugar and real Australian honey. Yellow Rock Sugar, Soy Sauce (Contains Wheat), Tomato Sauce, Glucose, Oyster Sauce (Contains Wheat, Crustaceans, Molluscs, Fish), Honey, Contains Permitted Flavourings, Flavor Enhancers (E621, E635), Salt, Yeast Extract, Citric Acid, Caramel.